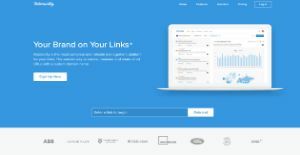 Rebrandly is a custom/branded link builder that helps individuals, companies, and organizations create and distribute short branded links. Branded links make it easy for visitors, potential clients, and business partners remember the user’s URL or site address, an essential element in the world of sales and marketing, advertising, and more. This is because it doesn’t require target audiences to memorize long links. Instead of boring and forgettable links, Rebrandly’s custom links are easy to memorize, recognize, and spread across various channels and circles. Rebrandly simplifies the whole process, allowing users to transform their long URLs or links into short yet easily recognizable and memorable links. Once the short custom links are generated, users can easily share them on various social media channels, including Facebook, Twitter, Instagram, Pinterest, and LinkedIn. Rebrandly supplies you with the quickest and simplest way to build, distribute, and manage branded links. It provides companies, organizations, and individuals a platform with which to brand and shorten the links they share by incorporating a particular domain name of their choice. Perhaps the foremost reason why you should start using branded links to help you market your business or service is that they are A easily memorable, pronounceable and completely customizable. With a branded link, companies and individuals are able to bolster the visibility of their brand, mainly because the brand name is embedded in the link- even when it’s being shared by others. People, especially your target audiences, tend to trust links that contain your brand name and service as opposed to long, boring links. As your business credibility increases with branded links, your click-through rate soars by as much as 39% as compared to using generic short URLs. This is why many international companies, brand ambassadors, and influencers are now using branded links instead of generic ones. With branded links, brands are more effectively representing the content they distribute as people will see the association between brand and content from the start. This encourages and cultivates trust on behalf of the audience because it makes it clear that what’s being shared is really endorsed by the brand itself. What Problems Will Rebrandly Solve? 1. BRAND AWARENESS & TRUST: Branded links boost brand awareness of companies with every link they share. Every link turns into a marketing opportunity that showcases their brand name, attracting the trust of potential customers. Branded links help increase CTR up to 39% when compared to generic short URLs. 2. LINK CONTROL: Itis impossible to retain control over links made using generic URL shorteners, as they don’t allow for editing or deletion of links. Rebrandly enables users to modify or erase links from one central dashboard at any time. In this way, it’s even safer than assigning employees company email addresses.Customers can also redirect links based on specific parameters of the user who is clicking (like sending them to customized landing pages based on location, language or the number of times they’ve clicked the link itself. 3. DETAILED ANALYTICS: Rebrandly is currently in the phase of adding robust analytics directly into the software that will allow customers to monitor with great precision which links, and by extension which campaigns, are performing well. A custom report builder feature is also in the works, which will then allow users to query their data with extreme detail. It will be very flexible and allow customers to view reports for virtually any parameter they wish. There are well-liked and widely used applications in each software category. But are they necessarily the best fit for your enterprise’s unique needs? A popular software application may have thousands of subscribers, but does it provide what you need? For this reason, do not blindly invest in popular systems. Read at least a few Rebrandly reviews and think about the factors that you desire in the software such as the fees, main features, available integrations etc. Then, choose a few solutions that fit your needs. Try out the free trials of these platforms, read online reviews, get clarifications from the maker, and do your research systematically. This exhaustive groundwork is certain to aid you choose the best software platform for your organization’s unique requirements. How Much Does Rebrandly Cost? Rebrandly offers free plans, as well as two pricing tiers for SMBs. Subscriptions can be upgraded at any time. Vendor can also create custom offerings for enterprise users with specific projects or high-volume use cases. We realize that when you make a decision to buy Marketing Software it’s important not only to see how experts evaluate it in their reviews, but also to find out if the real people and companies that buy it are actually satisfied with the product. That’s why we’ve created our behavior-based Customer Satisfaction Algorithm™ that gathers customer reviews, comments and Rebrandly reviews across a wide range of social media sites. The data is then presented in an easy to digest form showing how many people had positive and negative experience with Rebrandly. With that information at hand you should be equipped to make an informed buying decision that you won’t regret. Rebrandly is Amazing and Worth Every Penny! What are Rebrandly pricing details? What integrations are available for Rebrandly? Pros: You can do a lot more with links. I use them for emails, announcements, and marketing! Cons: I do find that the tool is only meant for a small database of links and requires more work towards batch management. Cons: it's still not possible to set the link-count to zero after the test-phase, which would be very helpfull and after all not that hard to program.too many steps until i get the final link. You can do a lot more with links. I use them for emails, announcements, and marketing! Ease of use and great user experience. Clean and simple layout. I've used them flexibly. They have exactly what I want. API. This product has a lot of flexibility. By that I mean, It has great features and API feature is awesome. I've used them to generate rebranded links from my app. Easy to use and reconfigure urls. And redirect the same url to different ones whenever needed. Rebrandly is a great URL shortener! The ability to edit the domain where the link points. If you need more information about Rebrandly or you simply have a question let us know what you need and we’ll forward your request directly to the vendor.